My colleagues teaching courses or whole programs in “arts entrepreneurship” often categorize the discipline as “new,” “nascent,” or “emergent.” I too have used those descriptors. It is useful, however, to remember that while teaching specific courses, offering certificates and degrees, and building a body of scholarship in “arts entrepreneurship” is relatively new to the academy, artists acting as entrepreneurs is as old as artmaking itself. Ruby Lerner, founder and director of Creative Capital notes in a recent talk “We have always thought of artists as entrepreneurs in the cultural area.” She sees artists as innovators and change agents. (I encourage you to watch her talk at the recent EmcArts “Innovation Summit.”) What is happening at universities across the country is, it seems to me, an aggregation of practice and the development of new theory to explain what has been going on for decades: artists creating, innovating, and making their own opportunities. This entry was posted in Arts entrepreneurship, Higher education and tagged arts entrepreneurship, Creative Capital, innovation, Ruby Lerner, theory. Bookmark the permalink. I doubt that modern aviation resembles anything close to what the Wright Brothers were doing to get their aircraft in the air or run their business. And I also doubt whether our modern idea of entrepreneurialism would have been anything Michaelangelo would have recognized as useful. Steven Naifeh and Gregory White Smith’s wonderful biography of Van Gogn shows us that he didn’t literally almost starve as an artists from lack of trying to be entrepreneurial. He died financially destitute because what we value so highly today in his work wasn’t valued at all in the entrepreneurial times he lived in. Entrepreneurialism or ‘art entrepreneurialism’ if you insist, didn’t provide for Van Gogn because it didn’t value him at all. And there lies the problem. And portraying young artists out of school as financial idiots (Business Insider) doesn’t help. Artists out of school are painfully aware that the system of galleries, the careers of teaching, the processes of public support no longer exist. I contend that part of the problem is the power structures insistence on the new language that treats good artists as those who are good business people. Pity the next Van Gogh. Good argument, re. Van Gogh. Here is another: Emily Dickinson, who’s work was discovered and published (to great success) after her demise. History is littered with such examples. If you read the Wikipedia page – http://en.wikipedia.org/wiki/Entrepreneurship – one gets the sense that there is something missing here in the attempt to label artists entrepreneurs. It doesn’t sound like what artists do, does it? Oh sure on the very basic level artists have to be business minded, but when wikipedia says that the term “implies qualities of leadership, initiative and innovation in manufacturing, delivery, and/or services”, there is something problematic in apply that definition to artists. Most artists exist outside this business model. They don’t follow conventional business plans, or have the same opportunities for funding, loans, etc. Artists in their best and most pure form don’t make what people think they want. They don’t serve the desires of the public then same way a consumer product manufacturer does. But what is even more interesting than this bad fit of a definition is to question who it is that wants to call artists entrepreneurs. That desire does’t originate with artists. Most of my artist friends bristle at the idea of being called something akin to a manufacturer or a banker. I believe this need to classify artists as another category of business originates in neo-liberal politics which wants people to think of artist just like business people. Neo-liberal politics doesn’t want public support for the arts, they want the arts to live and die under the rules that every other business does. They don’t want artists, they want art entrepreneurs. What my colleagues and I are attempting to do is actually just what you suggest – differentiate “arts entrepreneurship” from “entrepreneurship” more generally, just as theorists of social entrepreneurship and policy entrepreneurship have done and continue to do. I do not claim that *all* artists are arts entrepreneurs, but rather that many artists are, both historically and in the present day. Michaelangelo operated a large studio, negotiated commissions, paid – or sometimes didn’t – his assistants. Van Gogh painted in solitude much of his life and died never having supported himself through his art. There are artists who are entrepreneurial and artists who are not. But entrepreneurial action by artists can mean that artists reap the rewards of their creativity in their own lifeltime rather than dealers reaping it after they are dead. Rather than rely on wikipedia, which is itself born of a neo-liberal philosophy of information sharing, I encourage you to review the scholarship coming out of arts schools and liberal arts insituttions on the topic. Thanks for your post. I read it with excitement and I agree with what you say about arts entrepreneurship being “as old as artmaking itself.” That is well said and true. We (collectively as teachers) are indeed trying to explain what has been happening since the dawn of artmaking itself. 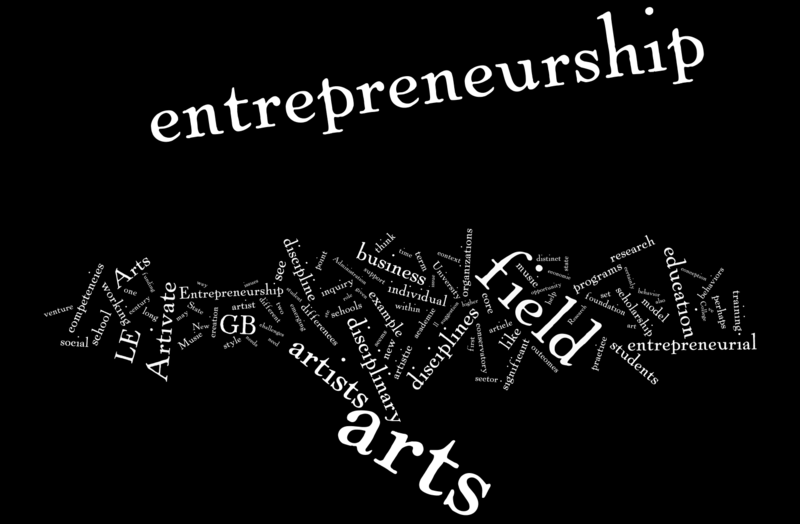 Simultaneously, we attempt to make the notion of entrepreneurship in the arts a commonplace one for artists. For example: At SMU, students are required to take Dean Jose Bowen’s FACE course as freshmen, where they get a remarkable introduction to entrepreneurship in the arts. Then if they choose to go on and minor in Arts Entrepreneurship or Arts Management, they can do so. Perhaps what is also happening is an autonomy movement. The internet has become an equalizer of sorts. Students have literally grown up with these powerful digital tools (such as Macbook Pro’s and other modern technological devices that encourage creativity). Students who want to create both within and without their disciplines are coming to find the skills of arts entrepreneurship liberating in their creative process and in the defining of who they are as creatives and not just “actors” or “dancers”, etc. It’s so exciting. Thanks again for your post. I think you hit a nail on the head.